If you are interested in sharing a room at the Williamsburg Lodge for the conference, contact Cher Smith to put your name on the list. You can access the list on the Members Only page of the PATH Intl. website. NOTE: PATH Intl. will not match up conference attendees but only supply the information. Every year, PATH Intl. centers and members nominate the very best equestrians, certified professionals, veterinarians, volunteers and equines serving at PATH Intl. Member Centers, and we are pleased to announce the regional and equestrian award winners. Each year our judges face an increasingly difficult decision to choose from among the outstanding nominations, once again demonstrating the high quality of service PATH Intl. Centers offer. Thank you to all the nominators for their dedication in recognizing the achievements of those in equine-assisted activities and therapies. A special thank you also to the judges! See the list of the 2016 PATH Intl. Region Award Winners here. PATH Intl. works diligently to obtain funding sources to ensure the maximum opportunity to underwrite registration scholarships for the PATH Intl. Conference and Annual Meeting. Donors and sponsors give generously to make these opportunities available to the greatest number of people. Congratulations to the following, who are the recipients of the 2016 PATH Intl. Conference Scholarships! Thank you to all who took time to apply. For applicants who weren't selected, please apply again next year for the 2017 conference in San Antonio, TX. There is no limit to how many years you may apply! Hear Ye! Hear Ye! Register Early! Registration for the 2016 PATH Intl. 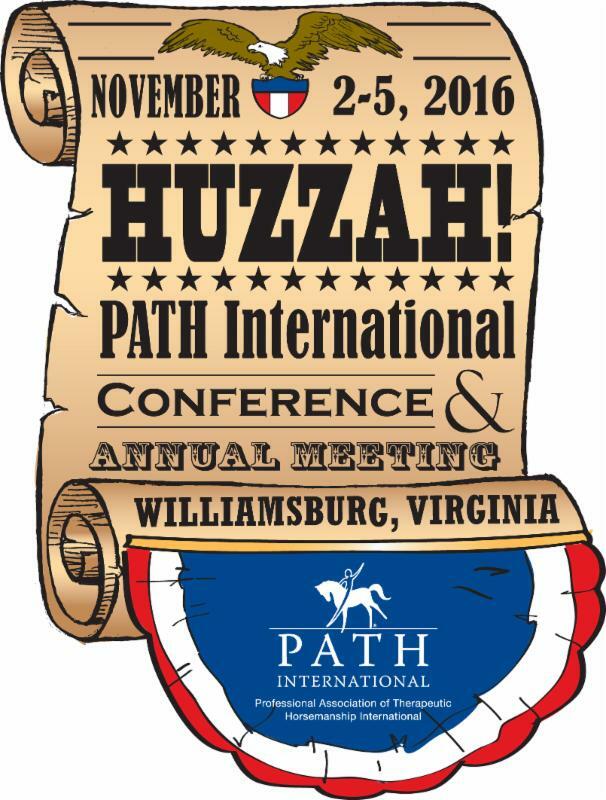 Conference and Annual Meeting, presented by title sponsor Purina, November 2-5 in Williamsburg, VA, is open. Click here to register and pick your sessions. The hard copy registration booklet and form was polybagged with the summer issue of PATH Intl. Strides. Or click the cover of the registration book (left) to open in your browser. From the framework of an international mentoring relationship, mentoring will be explored from agreements, communication and reflective practice to technology, teaching and tips. Marny Mansfield has an MS degree in animals and public policy, an MS degree in occupational therapy, and is a PATH Intl. Certified Master Instructor, mentor and faculty. Gain notoriety and bragging rights by showing conference attendees the great time had by all at your center. This was a huge hit last year! The conference host committee will judge and select the top two or three to show at the awards banquet on Friday, November 4, with others being shown throughout the conference. We aren't looking for promotional videos, but rather the videos that highlight your center's staff, instructors, participants and equines having a great time. Click here for an example from Hearts & Horses, Inc., a PATH Intl. Premier Accredited Center in Loveland, CO, the big winners from last year. Email your videos to Cher Smith. For larger video files, mail a CD or flashdrive, or email Cher for Dropbox instructions. Note: We need the actual video, not a YouTube or Vimeo link. Submissions must be sent by September 15 to allow time for judging. Please include a photo/video release form with submission. Reserve a table of 10 at the 2016 PATH Intl. Awards Banquet, November 4, 2016, for $50 per table. This non-refundable fee will benefit the PATH Intl. Disaster Relief Fund, which has been seriously depleted due to many requests this year, but it will also create a better system for tracking and assigning tables. Colonial Williamsburg is a 301-acre living history museum. Costumed employees work and dress as people did in the era, sometimes using colonial grammar and diction. Surviving colonial structures have been restored to estimates of their 18th-century appearance, with traces of later buildings and improvements removed. Of the approximately 500 buildings reconstructed or restored, 88 are labelled original. Unlike dry, dusty textbooks, Williamsburg will awaken a love of history! In-depth discussions of the equine digestive tract invariably mention pH, especially in reference to the stomach and hindgut. What is pH and how does it factor in the well-being of horses? Read more. Elizabeth (Beth) Large completed four semesters of American Sign Language coursework at Kent State University, where she graduated in 2006 with a degree in sociology and a minor in anthropology. She became a PATH Intl. Certified Registered Instructor in 2010 and a PATH Intl. Interactive Vaulting Instructor in 2014. Beth obtained her Master's of Occupational Therapy degree in 2016 and now works as a pediatric occupational therapist in addition to working as a PATH Intl. Certified Instructor in Northern Colorado.